The U-17 lads take on a new journey and will represent the nation at the AFC U-19 Championships. Luis Norton de Matos, Head Coach of the India U-19 National Team has summoned 29 probables for the preparatory camp being held in the Capital for the forthcoming AFC U-19 Qualifiers to be held in Saudi Arabia early next month. India who have been clubbed with hosts Saudi Arabia, Yemen and Turkmenistan in Group D play their first match against Saudi Arabia on November 4 followed by matches against Yemen and Turkmenistan on November 6 and 8 respectively. In a previous article, Khel Now revealed that sources close to the developments said that the U-17 boys will be playing the AFC U-19 championships in Saudi Arabia come the month of November. This tournament will be extremely beneficial for the boys after impressing the crowd in the U-17 World cup, the team would look forward to stepping up their performances in this tournament. Some of the stand-out players from the U-17 side such as Dheeraj Singh, Jeakson Singh, Amarjit Kiyam & Anwar Ali would love to carry over their current form to really establish a name for themselves in the footballing scene in India. 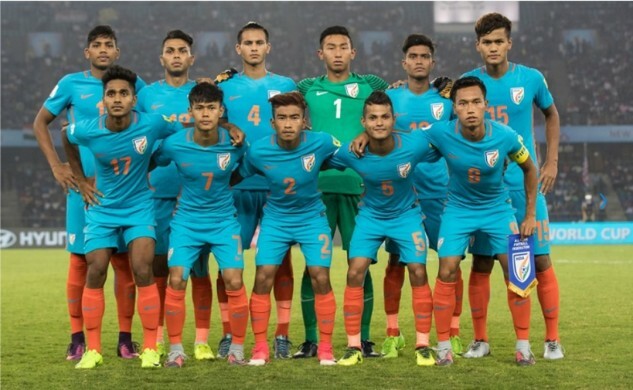 The probable list of 29 has players from the AIFF U-19 Academy as well as the Indian U-17 World Cup squad which played in the FIFA U-17 World Cup India 2017. India has presented one of the best FIFA U-17 World Cups so far. Here's why! Here’s what's next for the Indian boys that played the FIFA U-17 World Cup! What went wrong for India at the FIFA U-17 World Cup 2017? The contingent will be leaving Delhi on October 25 to Doha where they will be playing a practice match against Qatar U-19 National Team on October 28 before proceeding to Dammam, Saudi Arabia for the AFC U-19 Qualifiers. Players who've been left out are Namit Deshpande, who had a terrific game against Colombia. Also left out are Antony Hendry and Mohd. Shahjahan and Sunny Dhaliwal, players who didn't play a part at the FIFA U-17 World Cup earlier this month. GOALKEEPERS: Dheeraj Singh, Prabhsukhan Singh Gill, Mohammad Nawaz. DEFENDERS: Boris Singh, Jitendra Singh, Anwar Ali, Sanjeev Stalin, Sahil Panwar, Deepak Tangri, Amal Das, Namgyal Bhutia, Asish Rai. MIDFIELDERS: Suresh Singh, Ninthoinganba Meetei, Amarjit Singh, Abhijit Sarkar, Lalengmawia, Komal Thatal, Jeakson Singh, Nongdamba Naorem, Rahul Kannoly Praveen, Naorem Roshan Singh, Pranjal Bhumij, Abhishek Haldar, Princeton Rebello. FORWARDS: Aniket Jadhav, Rahim Ali, Lalawampuia, Edmund Lalrindika.